ATHENS, Ga. – University of Georgia sophomore running back Nick Chubb of Cedartown, Ga., sophomore wide receiver Isaiah McKenzie of Miami, Fla., and senior linebacker Jake Ganus of Chelsea, Ala., have been named the recipients of the Coffee County Hustle award. The awards are given annually at the conclusion of spring practice to recognize improvement, dedication and performance on the field. The Coffee County Award is given annually to players showing the most desire during spring drills. MVP ­ – Kolton Houston, OT, Buford, Ga.
Kublanow, OG, Marietta, Ga. and Brendan Douglas, TB, Augusta, Ga. Outstanding Walk-On ­ – Clay Johnson, FLK, Calhoun, Ga.
Coffee County Hustle Award ­ – Jake Ganus, LB, Chelsea, Ala. Most Improved Player ­ – Tim Kimbrough, ILB, Indianapolis. Ind. 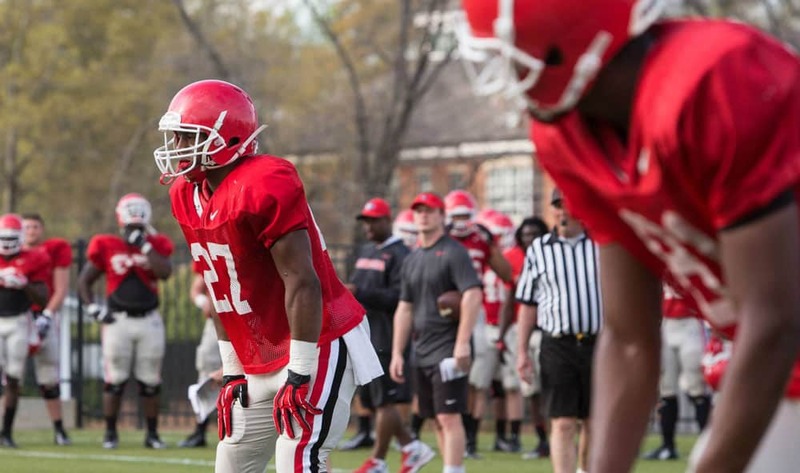 Outstanding Walk-On – ­ Aaron Davis, CB, Locust Grove, Ga.